The spot gold price may have baffled investors since its move south last December, but analysts at Citi (C) now see the precious metal being a leading indicator of U.S. Treasurys. Gold is about to enter "phase two" of its bear market, according to the investment bank, after a brief rally and its downside target is now $1,111 an ounce from its current price of $1,231. As well as this bearish outlook, it now sees gold being a leading indicator of U.S. Treasury bills. "Gold prices fell before and after [U.S. Federal Reserve Chairman Ben] Bernanke's warning about tapering in May, they then stopped falling in July, well ahead of the September [Federal Open Market Committee] 'no taper.' In fact, by the time of the September FOMC decision gold was falling again," analysts at the bank said in a research note released Monday. "Gold seems to anticipate monetary policy developments earlier than USTs. This is possibly because gold has, in the end, no intrinsic worth and no yield and is therefore hyper-sensitive to U.S. and global monetary policy." Citi's research shows that gold now has a roughly 60-day lead over 10-year Treasury yields. This suggests yields will be 2.9 percent by late January, it said, or 3.25 percent if gold hits $1,111. Often seen as a hedge against inflation, gold traditionally has had an inverse relationship to interest rates with demand for the precious metal increasing when rates are low. Last December was seen as a key turning point for gold prices with the commodity losing its close relationship with Fed policy announcements. In the 10 years up until last December, %VIRTUAL-article-sponsoredlinks%gold had surged around 400 percent, with the help of low interest rates, extra Fed liquidity and concerns over the global economy. Then on Dec. 12 , the Fed announced that it would buy $45 billion in additional Treasurys every month, on top of the $40 billion of mortgage-backed securities it already purchases, taking the total size of its quantitative easing program to $85 billion a month. Instead of this being bullish for gold, the precious metal actually posted a surprise fall of 1 percent. Michael Derks, chief strategist at FxPro who now no longer works for the company, said at the time that the rules surrounding the price of gold had suddenly changed. "For the gold bulls to remain in the ascendancy next year, a lot will depend on the much-feared inflation from global quantitative easing starting to show through. It's proving to be a long wait though," he said in a research note at the time. Sure enough, gold has since then fallen 27 percent. What's involved: You can buy gold bars or coins from coin dealers across the country. Many coin dealers have online businesses that will ship gold directly to your home. Pros: You have the gold in your possession, avoiding any risk of third-party misconduct that other methods of investing in gold entail. Some investors enjoy the coin-collecting aspect of gold bullion coins. Cons: You'll pay a markup to the current spot price to buy physical gold and might have to accept a discount when you sell it back. Also, you have to find and pay for a safe place to store your gold. What's involved: Some coin dealers offer pool accounts, which allow you to buy gold but arrange to have it stored with the dealer rather than taking delivery. At any time, you then have the option either to sell the gold back or arrange to have the dealer send you a physical coin or bar corresponding to your pool-account position. Pros: You have all the benefits of owning gold, but the dealer remains responsible for its care. You avoid dealing with shipping and insurance costs and have the assurance that it's held in a secure facility. The premiums for buying and discounts for selling also tend to be smaller than with physical gold. Cons: To take possession of the gold, you'll have to pay shipping costs and other fees. You also have to trust that the dealer running the pool account will take all necessary steps to protect it from theft or other dangers. What's involved: Gold futures contracts allow you to buy the right to take delivery of gold at a specified future date. Futures contracts tend to track the changing spot price of gold, paying you profits when prices rise and losing money when they fall. Most futures investors sell back the contract before it expires, never taking delivery of the physical gold underlying the contract. Pros: You get the potential financial benefits of owning gold without worrying about storing it. You also don't have to come up with the full value of the underlying gold, as futures contracts require only a small margin balance covering a fraction of the gold's total value. Cons: Futures contracts are only available through specialized brokerage accounts, and there are commissions involved. Most futures contracts may provide too much exposure, as a standard contract corresponds to 100 ounces, worth about $140,000 at current prices. You may have that much in your portfolio to invest, but putting it all into gold futures could give you too much exposure to one commodity. What's involved: Exchange-traded funds like SPDR Gold (GLD) own vast holdings of gold bullion. Each share of SPDR Gold has a value of just under a tenth of an ounce of gold, and those shares rise and fall with the price of gold bullion. Pros: Gold ETFs take responsibility for storage and protection of the gold in their possession, saving you the hassle and cost of owning physical gold. Cons: Although many gold ETFs own physical gold, some gold ETFs use derivatives rather than bullion to track changing gold prices. For those ETFs, you run the risk that the derivatives involved won't move in lockstep with gold prices, potentially causing you to miss out on a gold-price increase. What's involved: Hundreds of public companies mine gold. 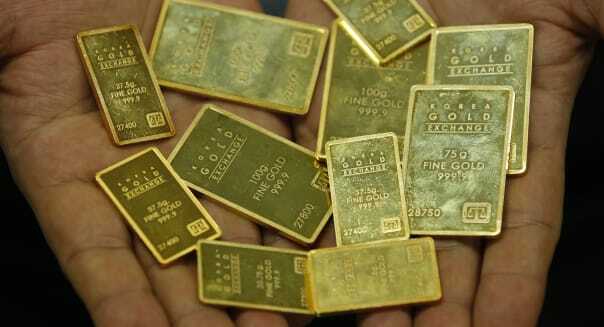 When gold prices rise, they earn more for the gold they produce, tying their value to that of the yellow metal itself. Pros: Unlike other investments, mining stocks can actually produce income. Some miners even pay dividends to shareholders. Cons: Mining stocks don't always track the price of gold, as other factors such as labor disputes and production costs can cause miners to suffer financial difficulties even when gold prices are high. Lately, gold-mining stocks have had far worse returns than bullion due to rising costs and falling profit margins. Each of these five ways to add gold to your portfolio has pros and cons. But if you see the value of having gold among your investments, they're all worth considering to give you the gold exposure you want.